Grow the Core stands conventional wisdom about business growth on its head and provides a proven formula for growing your business in recessionary times. These days, it′s a common belief among business leaders across industry sectors that the best way to grow their businesses is to expand into new markets. In reality, virtually all top–performing companies achieve superior results through a leading position in their core business. Unfortunately, there′s very little in the way of practical advice on how to do this. 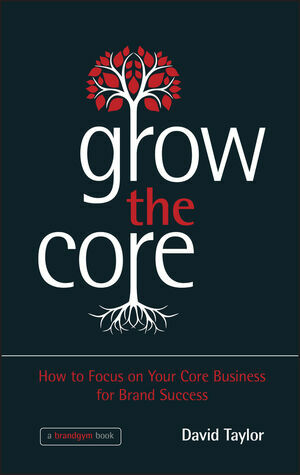 Grow the Core shows you how tofocus on your core business for brand success, with a program of eight workouts road-tested by the author's consultancy, the brandgym. The book provides inspiration, practical advice and proven tools for building and strengthening your core business. It is packed with case studies from brandgym clients, including Mars, Friesland Campina, SAB Miller and Danone. The book features exclusive brandgym research, in addition to front–line experience on over one hundred brand coaching projects. David Taylor is founder and Managing Partner of the brandgym, a network of senior brand coaches that help teams create a clear brand vision and the action plans to turn this into growth. Clients include Sainsbury’s, LVMH, Unilever, T-Mobile and SAB Miller. David as been named one of the world’s 50 leading marketing thinkers by the CIM. He is the author of four successful books on branding published by John Wiley: The brandgym, Brand Vision, Brand Stretch and Where’s the Sausage were all number 1 on Amazon’s branding books ranking. He also writes brandgymblog.com, one of world’s top 60 marketing blogs. David started his career in brand management with P&G before doing an MBA at INSEAD. He then started the Paris office of Added Value in 1993 and grew it to 50 people, leaving to create the brandgym in 2001, to spend more time on brand strategy, and less time bored in board meetings.